Follow these procedures to use stand-alone and linked Depth Windows, as well as view counterparties on both sides of the market for a given contract while still seeing other contracts in your Market Grid. From the Control Panel, click the Window menu and choose Depth Window. An empty Depth Window appears. Click the Instrument Explorer icon to select a contract. After selecting a contract, the window is populated with the available levels of depth on each side of the market. If detailed depth is not available for that contract, then standard depth data is displayed. If the Depth Window is not open, use the Control Panel to open it. From an open Market Grid, right-click and select Floating | Depth Window. Left click a bid or ask price for a contract. The linked Depth Window appears. The window has a yellow border around it to indicate it is linked to another window. Launch a stand-alone or linked Depth Window for a contract. Right-click in the stand-alone or linked Depth Window and select Show/Hide columns from the context menu. Select Ask Mbr and Bid Mbr in the Column Configuration window that appears and click OK. The counterparty names appear on both sides of the market in the Depth Window. 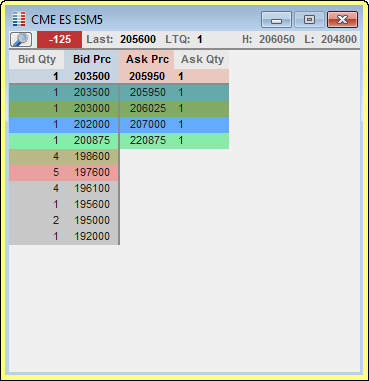 Click a bid or ask price or quantity in the Depth Window to launch a floating order entry window (e.g., MD Trader). Floating order entry is set in Global Properties from the Control Panel. 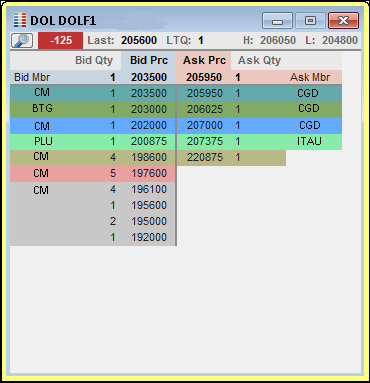 To change a contract, click Instrument Explorer or drag and drop a contract from the Market Grid (linked Depth Window only). To view counterparty names on both sides of the market, right-click and select Ask Mbr and Bid Mbr in the Show/Hide columns configuration window. Resize the window or column widths as needed.